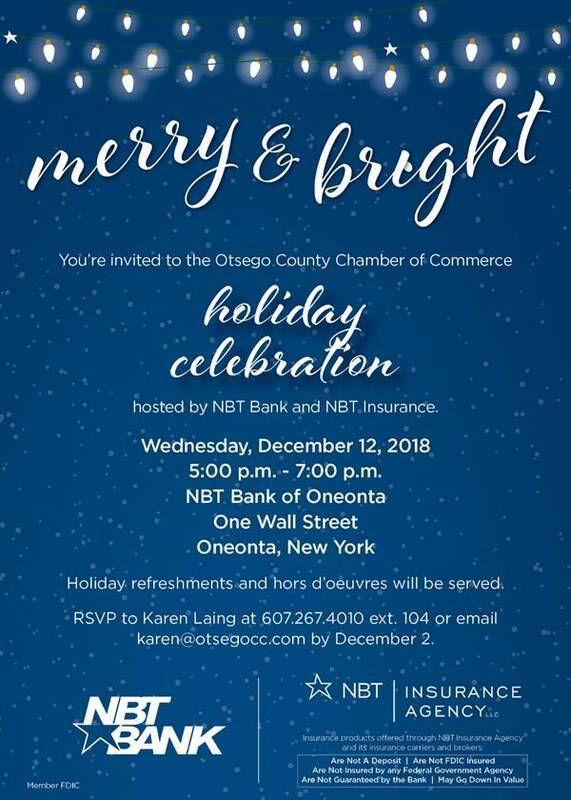 We invite you to our upcoming Holiday Celebration on Wednesday December 12, 2018 hosted by NBT Bank and NBT Insurance in celebrating the success of Otsego County Businesses. See attached invite. Otsego County Chamber to host NYS Mandated Anti-Harassment Policies and Sexual Harassment Training Wednesday, December 19, 2018 8:30a.m.-10:00a.m. Under Section 201-G, New York State mandates ALL employers (with as few as one employee) to adopt a sexual harassment prevention policy as well as to train ALL employees on sexual harassment prevention. The policies were to be in place by October 9, 2018. Initial trainings must be completed by October 9, 2019 and then annual thereafter. Trainings for employees and managers/owners are not the same. Managers and Owners have additional responsibilities and they must be trained on these. The policies and trainings have minimum requirements as outlined in Section 201-G.